“Historically, scientific reductionism has provided an amazing understanding of the nature of the body’s structure, from organs to cellular organelles and down to its genes. However, the limitations of this approach are clearly evident in science’s inability to resolve today’s healthcare crisis. You should first know what a Subluxation is. Subluxation means below or without(sub) light (lux). Light being nervous system flow, your life force without nerve flow our bodies die. It is less than a dislocation but greater than a sprain and most commonly viewed as a bone out of place putting pressure on a nerve decreasing nerve conduction. Subluxations happen through trauma (birth, car accidents, falls, learning to walk, ride a bike, carrying your purse on the same shoulder etc. ), Thoughts (stress, emotions etc.) and toxins (food, pesticides, alcohol, drugs etc.). At Wave of Life we approach chiropractic a little different than most offices. Dr. Carly utilizes an approach called Bio-Geometric Integration when adjusting that allows ease and gentle force. It is what is unique to Wave of Life because, no one in the area utilizes this approach. BGI views subluxation as a process/experience that wasn’t fully integrated into the body and it is now being stored in the bones, or soft tissue (organs, ligaments, muscle etc.) Once these experiences are fully integrated and the body knows how to process them you can further heal, grow, and evolve. BGI approaches the body by applying a natural geometry that is in every living structure and is triangular in nature. When viewing the body Dr. Carly looks at where this geometry is distorted and where the GREATEST potential is to release all of this distortion with the greatest ease and least force possible. Featured in The American Chiropractor magazine as one of the “10 Great” approaches to Chiropractic; Experience chiropractic from an entirely new perspective. Bio-Geometric Integration masterfully blends the philosophy, science, and art of chiropractic and enhances the chiropractor’s understanding of the human body. BGI provides comprehensive information of the innate geometry of the body and the force dynamics surrounding the creation and the release of subluxations. The philosophy, science, and art of chiropractic are examined from a post-newtonian point of view, providing the opportunity to express and comprehend chiropractic in accordance with contemporary science. Through understanding the innate geometry of the body, the chiropractor is able to more efficiently and gently release the subluxation and assess the effectiveness of the adjustment. 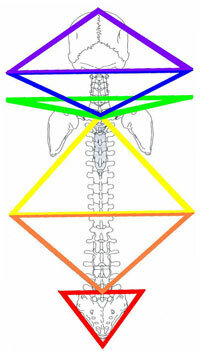 The geometric understanding of the body also serves to bridge the gap between the many techniques of chiropractic by providing a common language and understanding from which to converse.